It is Christmas Day today. Children all over the world will be waking up to a plethora of gifts underneath their tree. They will be shrieking in joy at the excitement of opening up a gift just for them. They will be playing with their new games or toys for the very first time with all the exhilaration that animates even the most phlegmatic and stolid amongst us. Whatever your views are regarding Christmas or the holidays matters little. Is this explosive elation in our children not one the most precious things to witness in our children? Many parents work hard building a business or acquiring wealth so that their children do not need to “suffer” as much. Ironically sometimes out of an environment of mild privation emerge the most dedicated and passionate individuals. Strong work ethic and a desire to achieve are the pillars of success. There is so shortage of rags to riches stories. Just as we, as parents, must encourage our children to devote themselves to their craft if they want to achieve mastery, so too must we encourage them to seek self-knowledge. Knowledge that is learned of one’s own accord becomes owned as opposed to knowledge passively given to us by others. Being comfortable in solitude or surrounding oneself with a small group of soulful genuine friends can facilitate this process. 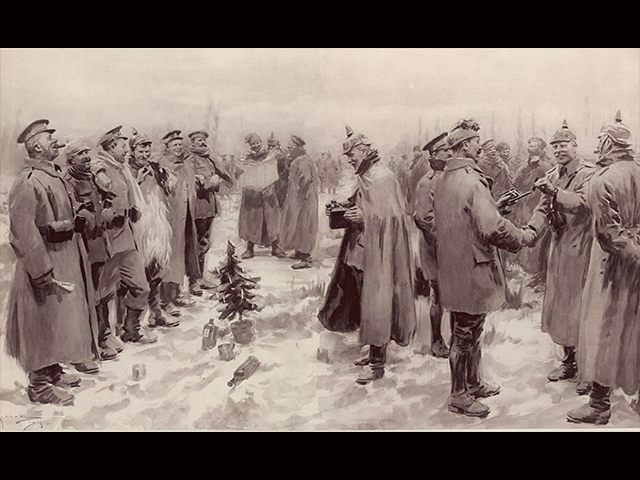 Before I leave you I would be remiss if I did not make mention of the Christmas Truce of 1914. Simply put, it was a brief pause in the bloodshed of the trench warfare that comprised World War I. To the immense chagrin of the superior officers for one day there was no more slaughter. For one brief day there was camaraderie, friendship, and benevolence. There was hand shaking, retrieving and burying of the dead. There was exchanging of gifts and conveying heartfelt messages of love. There was drinking, eating, laughing, and playing of games. For one brief day amongst the carnage, humanity shone through. The immense tragedy is that this magnanimous sentiment lasted only one day before the killing commenced once again. This is the power of one idea! This is why I write, produce videos, and interviews! This is why I focus my attention on discussion of philosophy, morality, and economics! War, oppression, and injustice are largely the result of ignorance and misunderstanding, not evil. I hope you all carry this Christmas spirit of compassion, kindness, and humanity far beyond this one day. I hope you all are able to carry it with you throughout your lives. This is what changes paradigms. This is what improves the world. Posted in Central Banking, Government, Voluntary Anarchy and tagged Anarchy, Christmas, Freedom, Government, Legal Plunder, Liberty, Military, Non-Aggression, Peace, Property Rights, Self-Ownership, Soldier, Sovereign Immunity, State, Truce, Voluntaryism, War.